Type Ia supernovae, which occur when burnt-out stars called white dwarfs detonate, have been used for years to help measure the distances to galaxies and the acceleration of our universe. But the tools aren't perfect, so researchers are analyzing the sites of the explosions to learn more about them and improve cosmic measuring tools. The astronomers then went on to show that these particular explosions occurred in more consistent ways, and thus are better standard tools for cosmology. 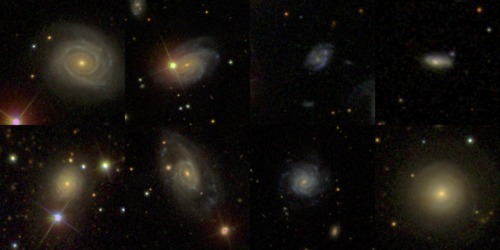 In the future, other "top-of-the-line" Type Ia tools -- the ones associated with young stars -- can be used to measure the distances of galaxies out to six billion light-years away or farther. From left to right and top to bottom, the galaxies (and supernovae) are: NGC 6038 (SN 1999cc), UGC 5234 (SN 2003W), A112539+2249 (SN 2004as), A225942-0000 (SN 2005ku), M+05-54-41 (SN 2006en), UGC 14 (SN 2006sr), UGC 8162 (SN 2007F) and IC 807 (SN 2007cp).